Montana national parks celebrate the vast great plains and glacial landscape of the Rocky Mountains, as well as the history of fur-trading, cattle barons, and battles between the Native American residents and the migrating wave of Euro-Americans from the east. 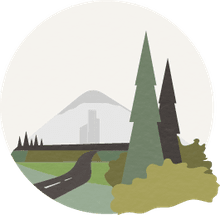 There are eight national parks, monuments, trails, and historic sites that fall partly or completely in the state of Montana, which are owned or managed by the United States National Park Service. Nearly six million visitors come to the parks each year. Big Hole National Battlefield, located near Wisdom, Montana, and part of the Nez Perce National Historical Park, is dedicated to the remembrance of the battle between the U.S. Military forces and the Native American group Nez Perce (nimí·pu· in the Nez Perce language). The pivotal battle in Big Hole took place on August 9, 1877, when the U.S. military led by Colonel John Gibbon attacked a Nez Perce encampment at dawn as they slept in the Big Hole valley. Over 800 Nez Perce and 2,000 horses were passing through the Bitterroot Valley, and they camped at the "Big Hole" on August 7. Gibbon sent 17 officers, 132 men, and 34 citizens to the attack, each armed with 90 rounds of ammunition, and a howitzer and a pack mule with another 2,000 rounds followed them down the trail. By August 10th, almost 90 Nez Perce were dead, along with 31 soldiers and volunteers. Big Hole National Battlefield was created to honor all who fought and died there. Big Hole is the highest and widest of the broad mountain valleys in western Montana, a valley that separates the Pioneer Mountains along its eastern margin from the southern Bitterroot Range on the west. Created by ancient volcanic forces, the broad valley is underlain by basalt rock mass covered by 14,000 feet of sediment. Rare and sensitive species in the park include Lemhi penstemon flower and camas, a bulb-producing lily that was used as food by the Nez Perce. Animals in the park include the western toad, swift fox, and Northern Rocky Mountain gray wolf; many birds migrate through, including bald eagles, mountain plovers, and great gray and boreal owls. Located in the southeastern quarter of Montana and extending into Wyoming, the Bighorn Canyon National Recreation Area preserves 120,000 acres in the Bighorn River valley, including the lake created by the Afterbay Dam. The canyons in Bighorn are between 1,000–2,500 feet deep and cut into Jurassic Period deposits, revealing fossils and fossil tracks. The canyons offer a diverse landscape of desert shrubland, juniper woodland, mountain mahogany woodland, sagebrush steppe, basin grassland, riparian, and coniferous woodland. Bad Pass Trail through the park has been used for more than 10,000 years and is marked by 500 rock cairns spread over 13 miles. Beginning in the early 1700s, the Absarokaa (or Crow) moved into the Bighorn country and made it their home. The first European to wander in and leave a description of the valley was François Antoine Larocque, a French-Canadian fur trader and employee of the British Northwest Company, direct competitors of the Lewis and Clark expedition. Crossing into North Dakota at the junction of the Yellowstone and Missouri Rivers, Fort Union Trading Post National Historic Site celebrates the early historic period in the northern Great Plains. Fort Union was built at the request of the Assiniboine nation, and, not properly a fort at all, the trading post was a uniquely diverse, peaceful, and productive social and cultural environment. The prairie, grassland, and floodplain environment found within the park is a major flyway for the seasonal passage of an array of migratory birds, including Canada geese, white pelicans, and golden and bald eagles. Smaller bird species include American goldfinch, lazuli bunting, black-headed grosbeak, and pine siskin. 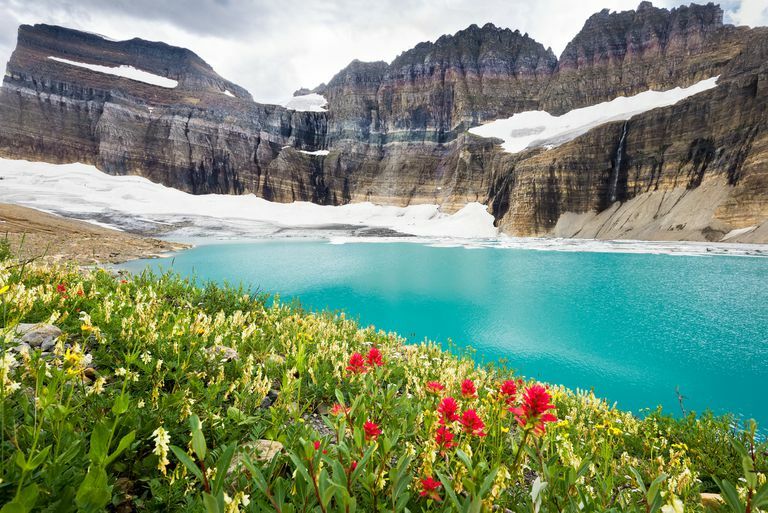 At Glacier National Park, located in the Lewis Range of the Rocky Mountains in northwestern Montana, at the border with Alberta and British Columbia, visitors can experience a rare glacial environment. A glacier is an active ice flow that changes throughout the years. The current glaciers in the park are estimated to be at least 7,000 years old and peaked in size in the mid-1800s, during the Little Ice Age. Millions of years before that, during a major glacial period known as the Pleistocene Epoch, enough ice covered the Northern Hemisphere to lower sea levels 300 feet. In places near the park, ice was a mile deep. The Pleistocene Epoch ended around 12,000 years ago. The glaciers have created unique landscapes, broad U-shaped valleys, hanging valleys with waterfalls, saw-toothed narrow ridges called aretes, and ice-cream bowl-shaped basins called cirques, some filled with glacial ice or lakes known as tarns. Paternoster lakes—a series of small tarns in a line resembling a string of pearls or a rosary—are found in the park, as are terminal and lateral moraines, landforms made up of glacial till left by paused and melting glaciers. When it was established in 1910, the park had over 100 active glaciers sited in the various mountain valleys. By 1966, only 35 remained, and as of 2019, there are only 25. Snow avalanches, ice flow dynamics, and variations in ice thickness cause some glaciers to shrink faster than others, but one thing is certain: all the glaciers have receded since 1966. The trend of retreat apparent at Glacier National Park, is also seen around the world, irrefutable evidence of global warming. The Grant-Kohrs Ranch National Historic Site in central Montana, west of Helena, preserves the headquarters of a 10-million acre cattle empire created in the mid 19th century by Canadian fur trader John Francis Grant and expanded by the Danish sailor Carsten Conrad Kohrs in the 1880s. Euro-American cattle barons such as Grant and Kohrs were drawn to the great plains because the land was open and unfenced, and the cattle—at first English shorthorn breeds imported from Europe—could feed on bunchgrass and then move on to new pastures when the old areas were overgrazed. Obstacles to that were Native American occupants and the vast bison herds, both of which were being overcome by the mid-19th century. By 1885, cattle raising was the biggest industry on the High Plains, and as ranches multiplied and the northern herds grew, there came a predictable consequence: overgrazing. In addition, a summer of drought followed by the fierce winter of 1886–87 killed an estimated one-third to one-half of all the cattle on the northern plains. Today, the Grant-Kohrs site is a working ranch with a small herd of cattle and horses. The pioneer ranch buildings (bunkhouse, barns, and the main residence), complete with original furnishings, are a reminder of an important chapter in the history of the West. The Little Bighorn Battlefield National Monument in southeastern Montana, near Crow Agency, memorializes the members of the US Army's 7th Cavalry and the Lakota and Cheyenne tribes who died there in one of the tribes' last armed efforts to preserve their way of life. On June 25 and 26, 1876, 263 soldiers, including Lt. Col. George A. Custer and attached personnel of the US Army, died fighting several thousand Lakota and Cheyenne warriors led by Sitting Bull, Crazy Horse, and Wooden Leg. Estimates of the Native American deaths are about 30 warriors, six women, and four children. This battle was part of a much larger strategic campaign by the US government designed to force the capitulation of the non-reservation Lakota and Cheyenne. The Battle of the Little Bighorn symbolizes the clash of two vastly dissimilar cultures: the buffalo/horse culture of the northern plains tribes, and the highly industrial/agricultural-based culture of the U.S., which was speedily advancing from the east. The Little Bighorn site contains 765 acres of grasslands and shrub-steppe habitat, relatively undisturbed.